However, you can now order a sedan version of the A-Class and the new CLA. Sure, the latter is certainly more dramatic to look at but not to a huge degree. 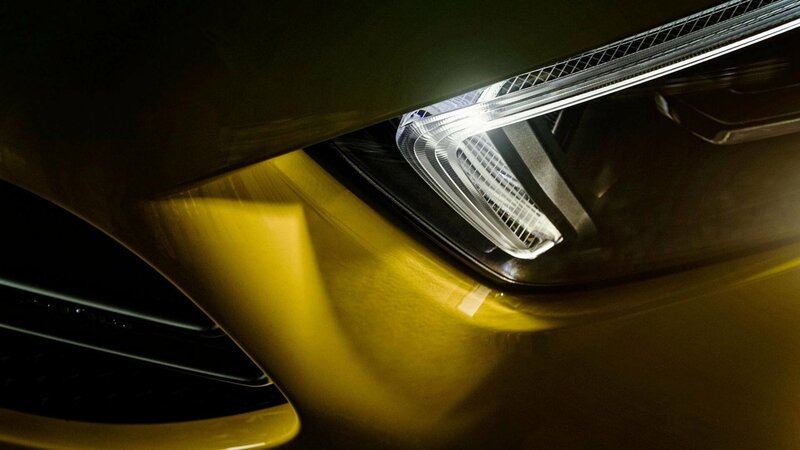 If you look at both cars from the front side by side, you will notice that only the headlights are really different. 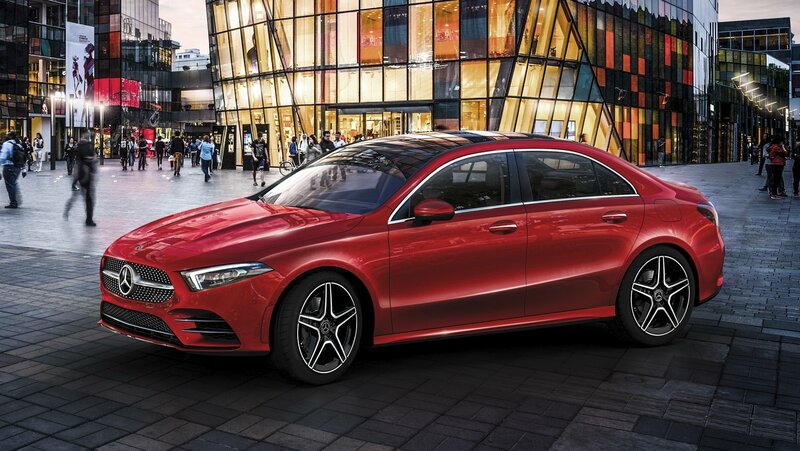 From the side, you can definitely see the CLA’s coupe-like roof and C-pillar – it’s the C-pillar of the A-Class sedan that really makes it look different. 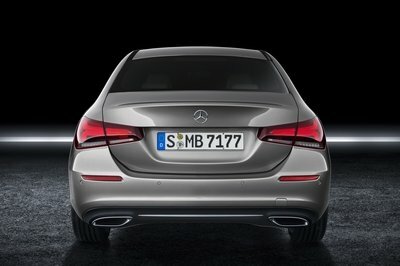 When it comes to the rear, the A-Class sedan has a unique design not shared with other Mercedes, whereas the CLA has almost identical clusters to the larger CLS. Step inside, and you’d be hard-pressed to tell which is which – spotting the interior differences is far trickier than doing so on the outside. 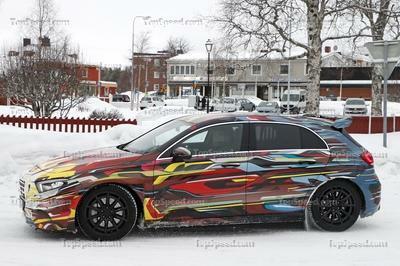 It’s been almost a year since Mercedes-Benz introduced the fourth-generation A-Class and we’re pretty anxious to see the new AMG A45 model. Thankfully, we don’t have to wait long as the beefed-up hatchback is set to break cover at the 2019 Geneva Motor Show. And the good news is that it will deliver more than 400 horsepower! 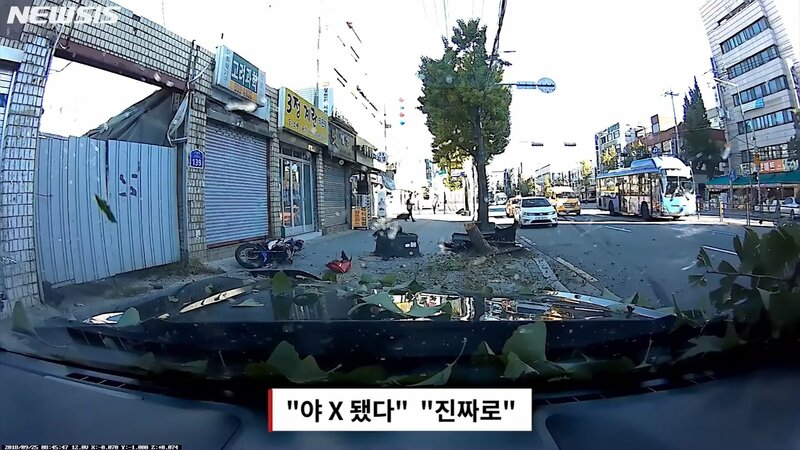 A Ford Mustang and a Mercedes A45 AMG were involved in a huge crash in South Korea after both cars figured into an ill-advised race that quickly got out of hand. A video of the race taken from inside the Ford Mustang shows the muscle car blatantly disregarding traffic laws in the country. According to the description, both the ‘Stang and the A45 AMG were reportedly running at speeds of up to 110 mph on roads with a 37-mph speed limit. The reckless driving ultimately came back to bite both cars in the bee-hind, resulting in the Mustang getting spun around and ending up on the sidewalk. There are no reports of injuries, so that’s about the only good thing to come out of this idiotic episode. 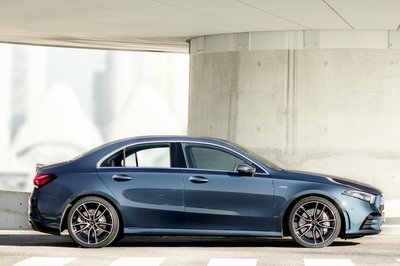 Mercedes is working on an all-new A45 AMG model to sit at the top of its A-Class lineup, and even though it’s set to debut sometime next year, we’re already learning new details about it – exciting details regarding how it will be very different from (and just plain better than) the outgoing A45 AMG. Mercedes-Benz finally showed the AMG A35 in the metal at the Paris Motor Show. Even though the car made an online debut a couple of weeks back, this is the first time we’ve seen it in its physical form. People have been waiting on the ropes for this car to arrive after the A-Class hatchback was launched a few months ago and it was well worth the wait. The color blue never goes out of style, so it’s fitting that in the Fashion Capital of the World, Mercedes-AMG unveiled the feisty A 35 in a resplendent blue shade that accentuates its sporting good looks. The hot hatch officially made its debut at the 2018 Paris Motor Show with a point to prove. While it does trace its roots to the A-Class, the AMG 35 is nothing like the model it’s based on. It looks angrier and more aggressive, and more importantly, it has a powerful 2.0 turbocharged four-cylinder engine that can embarrass the socks off anyone who underestimates its performance capabilities. 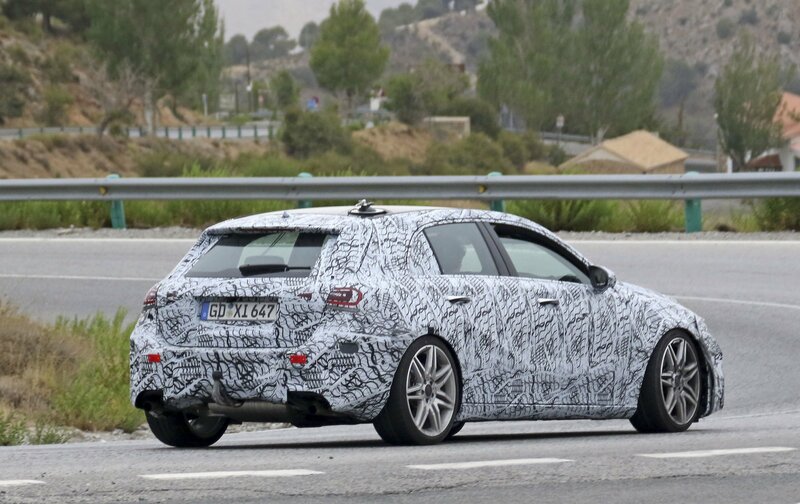 The Mercedes-AMG A 35 doesn’t have a price yet, but those details will be announced sometime in 2019. Unfortunately, it’s not coming to the U.S. When Mercedes-Benz unveiled the fourth-generation A-Class in 2018, it basically dropped a giant anvil on the hatchback market. Fitted with never-before-seen technology and infused with design cues from the bigger sedans inside and out, the new A-Class trumps the BMW 1 Series and the Audi A3 in just about every department. With a handful of models already available, Mercedes-Benz just unveiled the AMG A35. 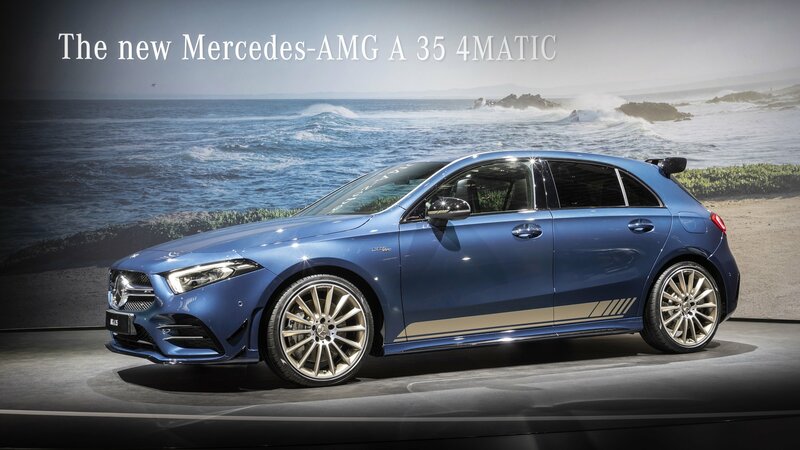 Offered for the first time, it slots above the A250 and below the upcoming AMG A45. The A35 is Mercedes’ answer to the long-standing Audi S3 and BMW M135i and arrives just when these two hatchbacks are getting a bit long in the tooth. But while the 1 Series is almost out of the market, to be replaced by a front-wheel-drive model, the S3 was facelifted recently and will be around for a few more years. That’s why we decided to throw the S3 into the lion’s den and find out how it compares to the new Mercedes-AMG A35. The Mercedes-AMG A35 is an intermediate, performance-oriented model of the fourth-generation A-Class hatchback. Offered for the very first time since the subcompact was introduced in 1997, it slots between the A250 trim of the standard A-Class and the range-topping AMG A45. The AMG A35 is Mercedes’ response to intermediate performance-oriented hatchbacks from BMW and Audi. Both Germans brands have been offering models like the M140i and S3 for quite a few years now, and they’ve been very popular with customers who a bit more than what the standard models offer, but don’t want to go all out on proper M or RS cars. 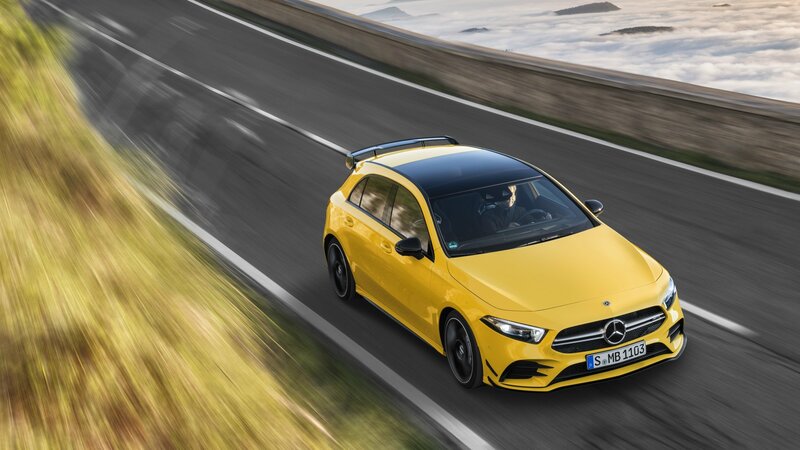 The AMG A35 joins the battle with more than 300 horsepower on tap, sportier looks, and all the state-of-the-art tech that Mercedes-Benz debuted on the regular A-Class. 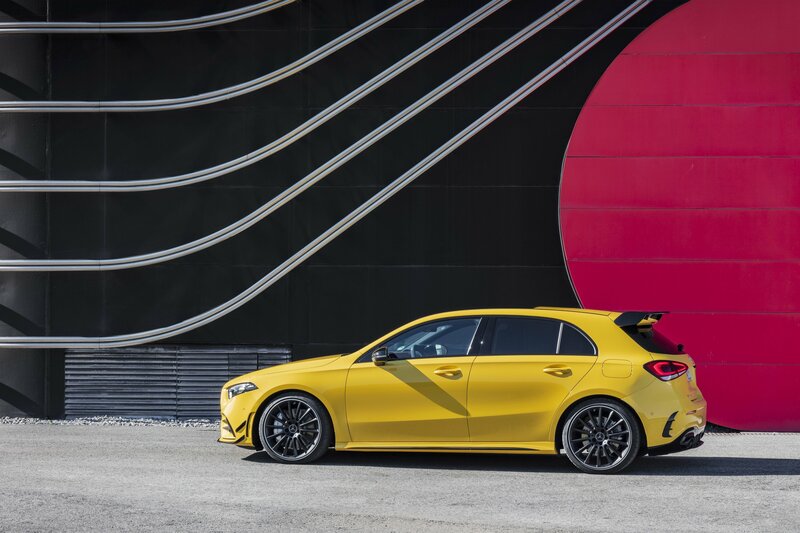 Continue reading to learn more about the Mercedes-AMG A35. Following a round of teasers, Mercedes-AMG has finally revealed its latest fire-breathing hatchback – the 2019 A35 4Matic. “Body shell, suspension, all-wheel drive, transmission, driving programs, fine tuning – every detail has been designed for maximum driving dynamics without compromising on everyday comfort,” Merc announces. 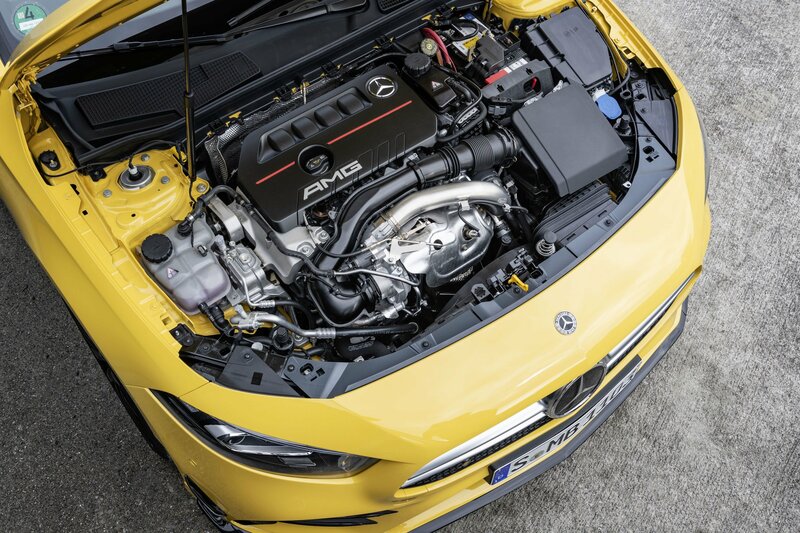 The main party piece can be found under the hood, where Mercedes stuffed the hot-to-trot A-Class with a turbocharged four-cylinder making as much as 306 horsepower and 295 pound-feet of torque. Properly applied, its enough to send the A35 to 100 km/h (62 mph) in a scorching 4.7 seconds, while top speed clocks in at 155 mph. The boost snail is a twin-scroll unit for sharper response. Routing the muscle is a seven-speed dual-clutch automatic transmission, which feeds an AMG-tuned, electro-mechanical 4Matic AWD system. The torque split can vary between front-wheel drive only, to a 50:50 split front-to-back. Keeping it shiny side up are MacPherson struts up front and a four-link for the rear. There’s plenty of aluminum to keep it all light, while a set of adaptive dampers can be had for a little extra outlay. Large four-pot brakes clamp the front, with brake rotors that measure in at 13.8 inches in front and 13 inches in the rear. The A35 looks the part of a hooligan thanks to AMG’s classic styling chops, which includes a unique grille in the nose, aero-optimized 18-inch wheels in the corners, and a large spoiler mated to a pronounced diffuser in the rear. Inside the cabin, you’ll find the latest MBUX infotainment goodies, plus AMG’s signature upholstery treatment and a flat-bottom steering wheel. A fully digital instrument display provides the feedback. Look for the 2019 Mercedes-AMG A35 4Matic to strut its stuff early next month at the 2018 Paris Motor Show. There is something special about hot hatches. That something is the way they zip around with their little bodies as if some hell broke loose, and throwing its hat into this ‘cult’ is Mercedes with the A35. No, wait; I’m talking about the Mercedes-AMG A35. The car was spotted burning rubber at the Nurburgring recently, and from the looks of it, the car is set to take on the world. Talking business now, are we? 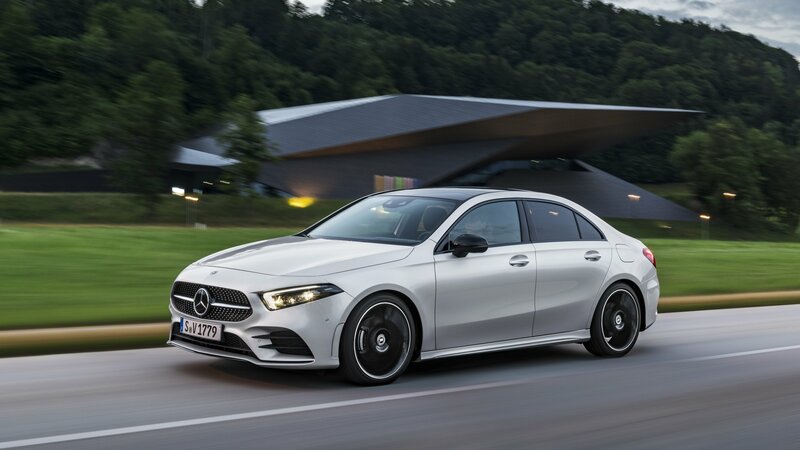 With the launch of the new Mercedes A-Class, Mercedes-Benz is once again adding some special edition spice to the proceedings with the release of the A-Class Sedan Edition 1. The special edition version of the A-Class packs a lot of exclusive equipment in its tight body, all coming as standard to the model. It will also be compatible with all engines being offered for the A-Class as well. Mercedes only plans to sell the A-Class Sedan Edition 1 for around a year. that I have no doubt the company is going to dominate the market. Even more so than it did when the CLA appeared some time ago. Ok, the world did receive much the same car, but the market habits of US customers (yours, actually) did make the A-Class sedan slightly different compared to all others. And, If I am to assume, cheaper as well. So, in short, Americans will buy a lot of A-Class sedans that are better equipped and quicker than in the rest of the world for less money. If you are still wondering why the U.S.-spec A-Class Sedan is one of the best ever, I’ve compiled a list of five reasons for you. The Mercedes A-Class Sedan has arrived, and it’s packing a wallop of new features. 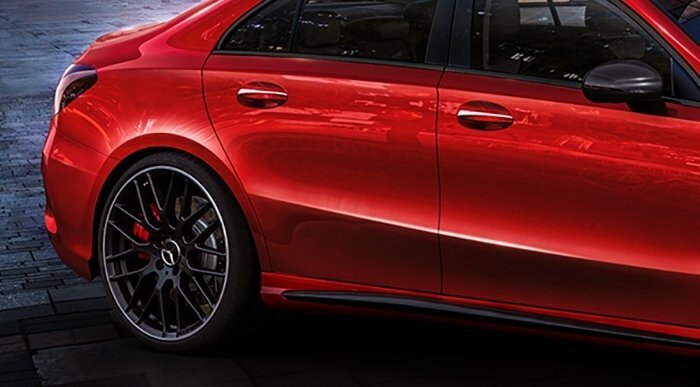 Most of the headlines will probably gravitate towards the sedan’s MBUX infotainment system, making it the first U.S.-bound Mercedes to feature the high-resolution widescreen cockpit and touchscreen media display with augmented reality capabilities. But don’t focus all of your attention on the infotainment system. The new A-Class Sedan is more than just that. It also happens to come with a design that’s far and away better than how its predecessor looked. Is This What the Mercedes-AMG A45 Sedan Will Look Like? Shown in 2017, the four-door version of the A-Class hatchback morphed into a production model at the 2018 Beijing Auto Show. 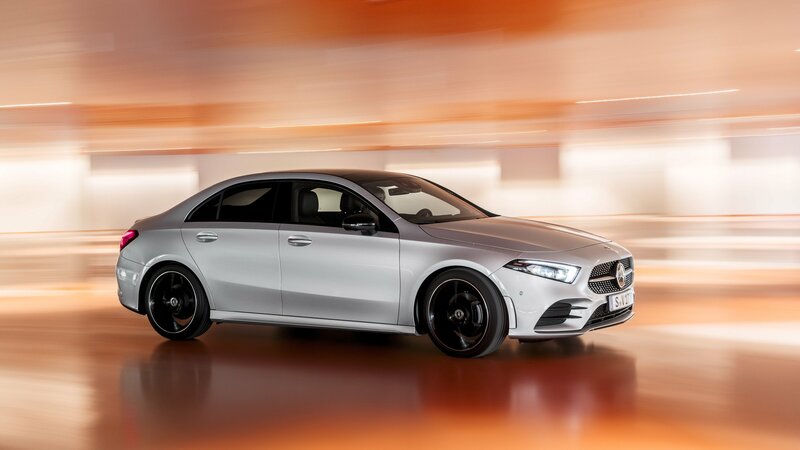 Unveiled with a slightly longer wheelbase than usual, the A-Class Sedan will soon become a global vehicle and will cross the pond to the U.S. to take on the Audi A3 Sedan. 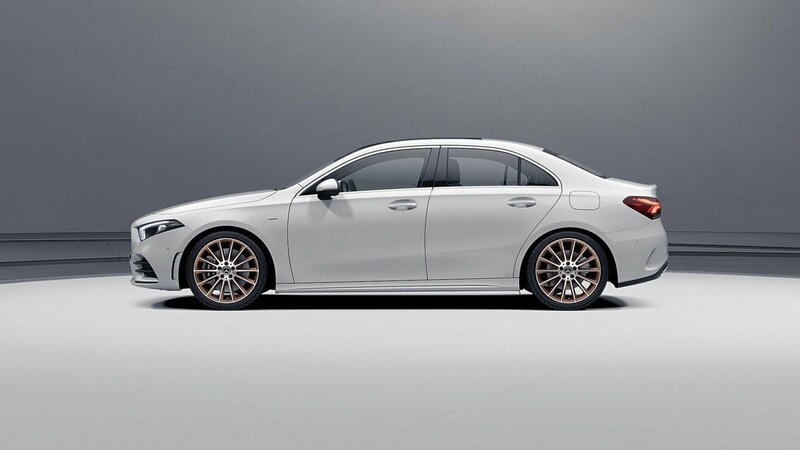 Like most Mercedes-Benz models, the standard A-Class Sedan will be followed by an AMG model. 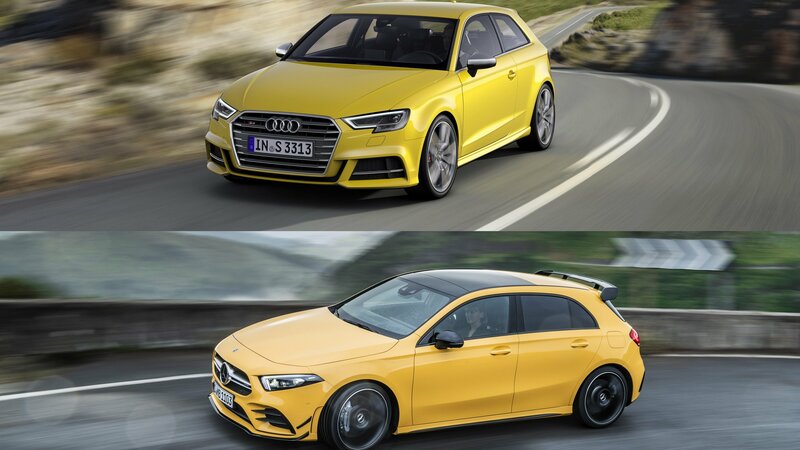 Likely to be called the AMG A45 Sedan, the beefed-up four-door will compete against the Audi RS3 Sedan, currently the only performance-rated vehicle in this niche. The AMG model is still at least a year away, but we may already know what it looks like thanks to a new rendering from X-Tomi Design. Unveiled as a concept car at the 2017 Shanghai Auto Show, the sedan version of the A-Class unveiled itself to the world in production form at the 2018 Beijing Auto Show. As expected, the A-Class Sedan is pretty much a shrunken CLA, boasting a coupe-style roof and a short deck lid. Shown here is the longer wheelbase version developed specifically for the Chinese market. Set to go on sale in the second half of 2018, the A-Class L sedan is produced at produced at Beijing Benz Automotive (BBAC), a joint venture between Daimler and BAIC Motor. While the A-Class L won’t be sold outside China, a regular wheelbase model will follow in the second half of the year to take on the Audi A3 Sedan in Europe and the United States. And AMG variant is also likely, but until that happens, let’s find out what sets the A-Class Sedan apart from its hatchback sibling. Continue reading to learn more about the Mercedes-Benz A-Class L Sedan.